Digitizing the factory isn’t always easy. A former counter-intelligence officer and former reality TV star, both manufacturing nerds, hope to bring data tools, the Internet of Things, and Lean Manufacturing to every factory floor. Manufacturing technologies have been changing fast. And it’s amazing what you can make custom and on-demand, and how you can iterate in the physical world. But transforming a factory to digital manufacturing is not so easy. And that’s where this week’s guests come in. Rony Kubat and Erik Mirandette are from Tulip Interfaces, a company spun out of the MIT Media Lab. Through their work with lab sponsors, they realized how hard it was to digitize a factory. And so they set out to change that. A company can get started with no programming experience and as little as $3,500. I was a little skeptical at whether some techies can just waltz in and transform a factory. So I was eager to see how it works and hear about what they learned along the way. We hear their lessons learned about implementing lean manufacturing and removing paper and pen from the factory floor. They also tell stories about riding motorcycles across Africa, surviving civil wars, counter-intelligence missions, and being on reality TV. Rony Kubat is a PhD graduate from MIT with a research focus on applied machine learning. He was the first employee at Bluefin (acquired by Twitter). Before graduate studies, Rony was a science and technology advisor for Hollywood film productions. Rony has been described by Wired Magazine as having a “steady low voice that could pacify a riot.” He is a playwright and is a member of the Junkyard Wars team, the Geeks (3rd Place, US Season three). 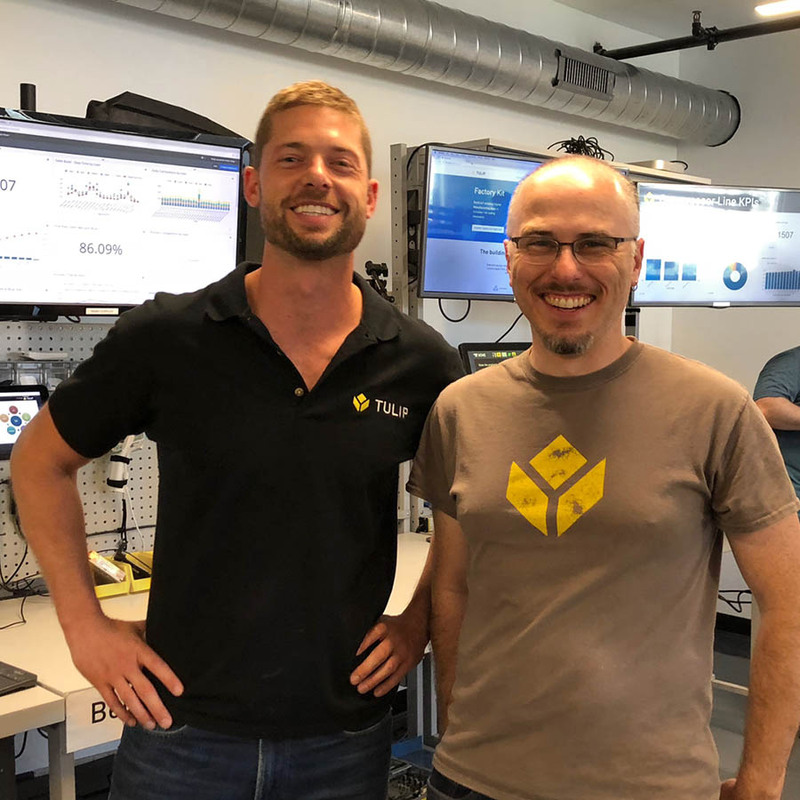 Erik Mirandette leads the customer team at Tulip, a three year-old manufacturing software company that spun out of the MIT Media Lab. Tulip has been recognized by industry analysts as top of class in the manufacturing software space, winning Gartner’s “2017 Cool Vendor”, IDC’s “2017 IDC Innovator”, and Frost & Sullivan’s “2017 Entrepreneurial Company of the Year”. At Tulip, Erik has led the implementation of digital transformation projects for multiple Fortune 500 companies in aerospace and defense, apparel, medical device, pharmaceuticals, consumer electronics, and contract manufacturing. Prior to Tulip, Erik served as a military officer for more than six years, assigned to the AFOSI Strategic Counterintelligence Branch with tours in Afghanistan, Southeast Asia and Japan. He was awarded both the Army and the Air Force Commendation Medals for meritorious service while serving overseas. Erik, a Tillman Scholar, also spent time in the non-profit space based in North Africa, and in venture capital. Erik holds a BS from the Air Force Academy, an MA from Norwich University, and an MBA from MIT. He is also the author of “The Only Road North,” a memoir of his experiences in Africa.